It can sound heavy for a PM outsider, but the message inside is simple – remember it’s about people, not processes. First, we agreed on what was the key message that should be visualized. Finally, I drafted a diagram illustration showing the outcome of applying those two elements. I used our hand drawn scribble shapes for that, to give it natural organic look, but in general, a default PowerPoint shapes would do, too. 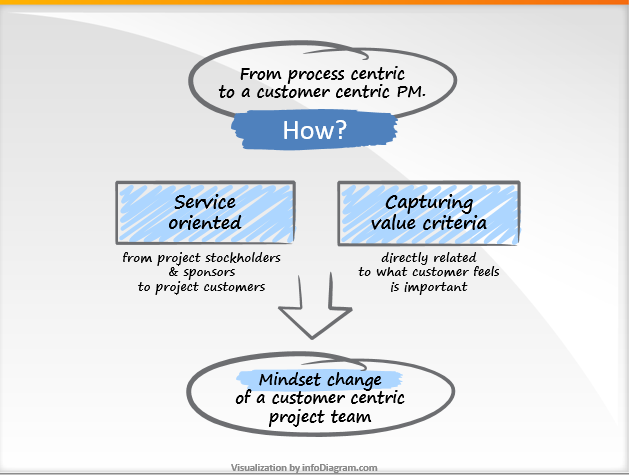 The full article is on LinkedIn “How to deliver a customer-centric project?”.